Awards — Oscars’ near or complete misses? IF anything, the pundits were right about the Golden Globes not being an indicator or predictor of the nominees for the Academy Awards, also known as the Oscars. Speculation was rife for months as tabloids, bloggers and entertainment news sites pitted celebrities against each other before the announcement of nominees was made final last Thursday. Typically, the Golden Globes kick off Hollywood’s annual red carpet glamour and awards fever. This is followed by The Critics’ Choice Movie Awards that was held last Thursday. The Oscars will be held on Feb 22. The announcement for the nominees of the 87th Academy Awards was received with a few surprises and snubs with romantic-comedy queen Jennifer Aniston not getting an Oscar nod for her role in the drama Cake. And despite winning the Globe for Best Actress for playing Margaret Keane in Tim Burton’s Big Eyes, Amy Adams was also snubbed. Still, it’s unlikely that Aniston lost any sleep over it as she was quoted telling entertainment news site E! : “I’ll be in bed when it’s (the nominee list) is announced.” Also joining on the list of snubbed celebrities — as Daily Mail reports — are Angelina Jolie for her directorial work in wartime epic Unbroken, as well as Jake Gyllenhaal for his role in Nightcrawler. Unbroken and Thriller were nominated at last Thursday’s Critic’s Choice Awards for Best Picture, and though both flicks did not bag the coveted title at the event (nor were they given an Oscars nod), Rosamund Pike made it to the Oscars list for Best Actress. She contends against Felicity Jones, Marion Cotillard, Julianne Moore who has won the title at the Golden Globes and Critics Choice Awards, and Reese Witherspoon. In the Best Actor nominee list, funnyman Steve Carell is up against Briton Benedict Cumberbatch, Michael Keaton who won at both the awards for Birdman, Eddie Redmayne and Bradley Cooper. 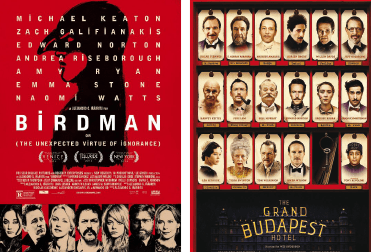 The Grand Budapest Hotel shares nine nominations with Birdman at the Oscars but coming of age flick Boyhood has firm-footing having won the Best Picture title at both the Golden Globes and Critics Choice Awards. If the winnings of the Critics’ Choice Awards are anything to go by, put your money on comedy-dramas Boyhood and Birdman — which both won big that night.